Relatively easy ascent from the east. Picture from simon3 : Beenduff and its setting. Picture: Beenduff and its setting. 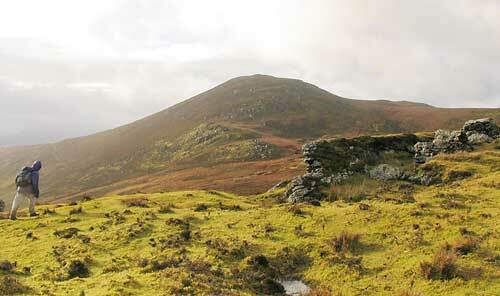 About 600m SW of of Moanlaur there is another flattish summit, Knockmore. It could be argued that it is a separate peak, however by my reckoning its prominence (the amount it rises above any connecting ridge in this case from Moanlaur) is about 26m which is less than the 30m that our current list requires. From Knockmore's top further Kerry views are plentiful. There's the sea to the south with Inch Strand and Cromane sticking into Dingle Bay. There's views to the north west towards Stradbally Mountain. Picture from simon3 : Moanlaur from the East. Picture: Moanlaur from the East. 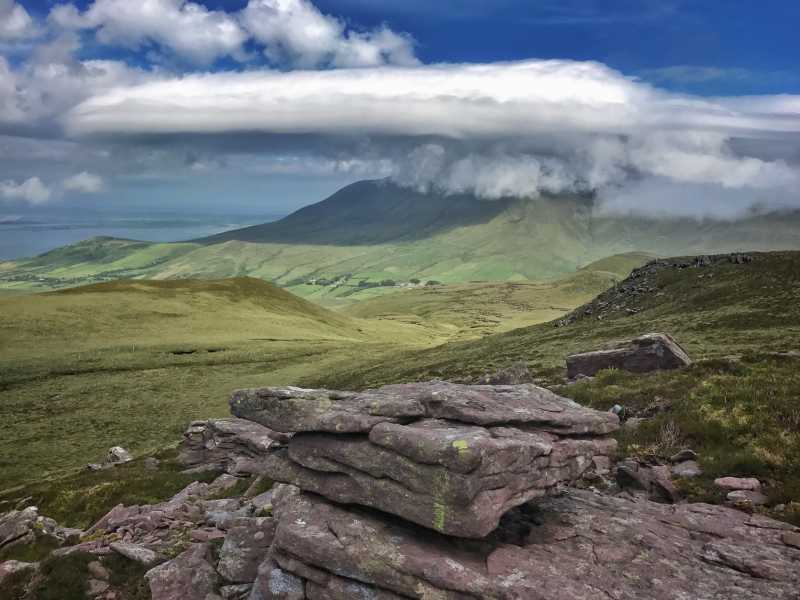 Perhaps you are resting between major days of climbing, perhaps you are looking for a great place to find a Kerry view. Whatever, I would recommend you try the walk to Moanlaur from the East. It's not far but it has great views. One place to park and start is from the Aughils to Camp road where there is a little parking, for example at Q71601 05001 B. Going South to North this road goes up the gentle side of a scarp. The north side has a steep face which continues west into the corrie valley cut into the (inevitable) north east corner of Knockbrack 459m, the eastern end of the ridge leading to Moanlaur. Walk along this for interesting views into the valley known as Coumastabla which appears to have considerable mine workings. Richard Mersey [The Hills of Cork & Kerry 1987] is the only guidebook I could find mentioning this walk. 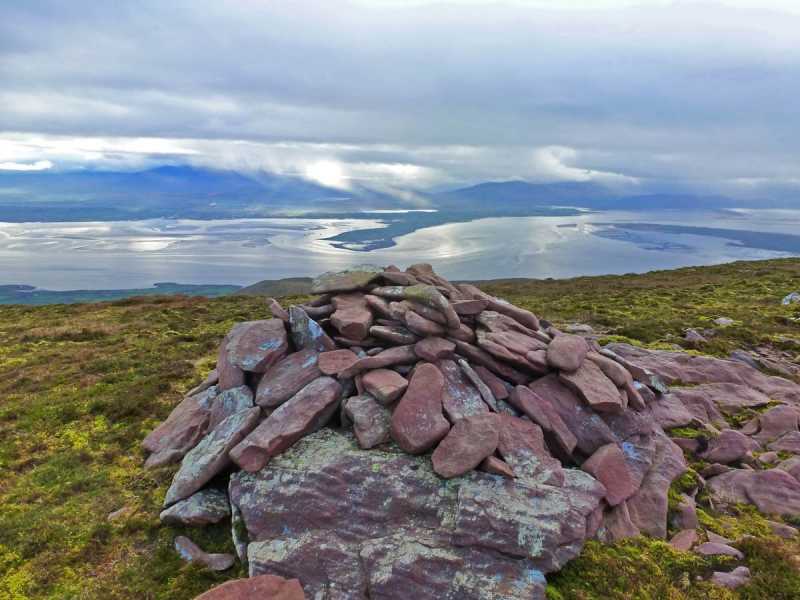 He said "It [the walk] is, simply, the traverse of the western Slieve Mish, that is Knockbrack, Moanlaur, Knockmore and trig. point 1,584." 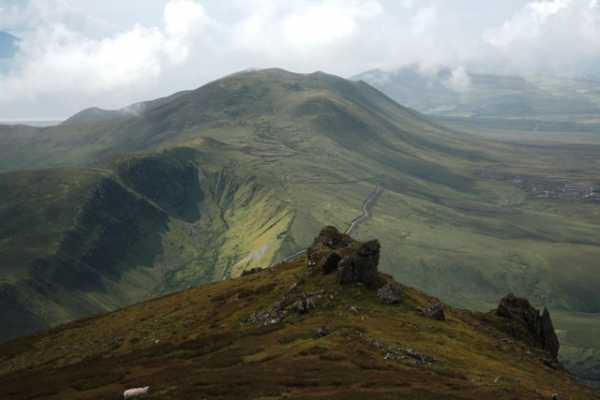 Moanlaur is reached across boggy more or less trackless terrain although as of 2005 there was some fencing which conveniently had fallen down at its nearest point to the summit probably because the posts of the fence had come loose in the soft ground. Not surprising since Moanlaur's name is about bog - Moanlaur means Middle Bog. Picture from simon3 : Cromane Strand in sparkling sea. Picture: Cromane Strand in sparkling sea. Another photo from the ridge, this one about 1.2km NE of Moanlaur (near Knockbrack).